...is definitely a path paved with treats. For some reason, Valentine's Day is one of those holidays that we just can't help celebrate… I'm 99% sure that it has something to do with the massive amount of seasonal sweets that start showing up in our local Duane Reade in January. 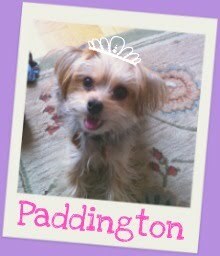 We're also 99% sure that Paddy has no grasp of the concept of Valentine's Day, and thus assume she also enjoys Valentine's Day mostly for the toys and treats we indulge her with (seriously… we need to re-examine our relationship). 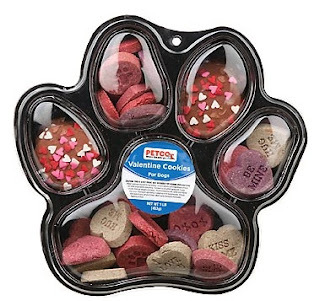 While we can't shower her with chocolate kisses or Necco SweetHearts, we can give her the next best thing: check out this tasty looking Valentine's Day Sampler from PetCo! Chock full of yummy treats, including adorable conversation heart biscuits (!!) and cookies covered in dog-friendly frosting and sprinkles. Available from online from PetCo for $6.99.